This is one of my favorite breakfasts to make when I don’t bring mine to work. I used to be super intimidated by the sound of poaching an egg, but it’s seriously so easy to do and NOTHING beats a poached egg. I love this breakfast because it’s combining a lot of healthy elements but it is so delicious that it feels like I’m splurging. 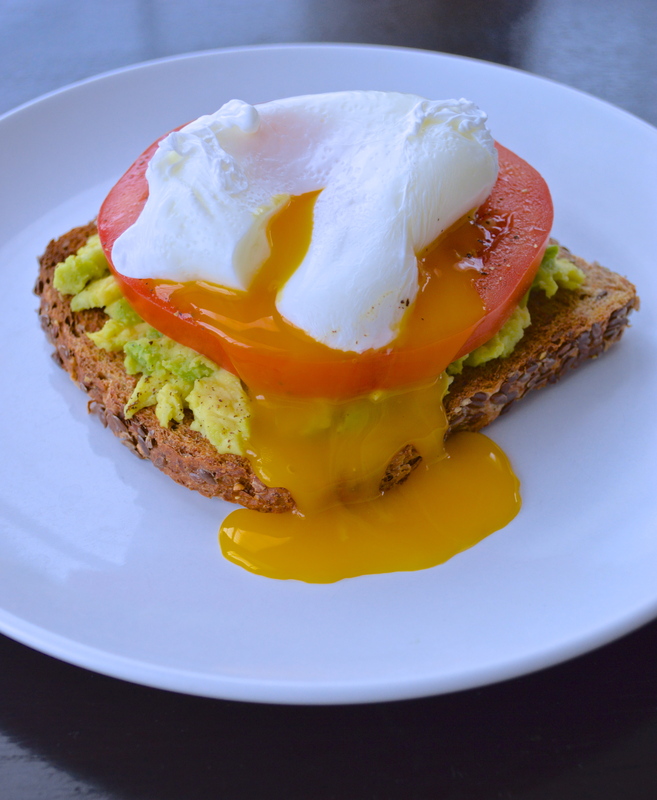 I use a toasted piece of the Ezekial Flax bread from my last favorite things post as the base, mash up an avocado with some pepper and lime, top that with a thick slice of tomato and top it all with the poached egg. Once you cut into the egg and the yolk drips down over everything, it’s creamy and SO yummy! Start off by building the “base” for the dish. Cut an avocado in half and then remove 1/4 avocado to use. I find it easiest to run a knife down the middle of the avocado half + then run a spoon in between the skin + the flesh… it pops right out! Sprinkle the avocado with a little fresh ground black pepper + squeeze 1 wedge fresh lime onto the it. Mash with a fork to combine, my avocado was not any where near ripe enough but such is life when you are at the mercy of the grocery store haha. Toast 1 piece of Ezekial Flax Bread and put it down on your plate. Top with the mashed avocado. Slice 1 thick slice of beefsteak tomato and place that on top of the avocado, seasoning it with salt + pepper. Now you can poach you egg. In a wide saucepan, fill with about 4 inches of water and 1 tbsp vinegar. The vinegar will help stop the egg whites from separating from the yolk! Bring to a boil and then reduce to a steady simmer, sort of in between a simmer and a boil. Crack 1 large egg into a shallow dish. I like to create a very slight “whirlpool” in the water before dropping the egg in because I find this helps stop separation of the egg as well. Swirl a slotted spoon gently in a counterclockwise motion to do this, then put the mouth of your dish right on the surface of the water and carefully slide the egg in. Use your spoon to wrangle in any loose bits of the egg whites and gently keep the water moving with the egg cooks for 3 minutes. After the three minutes, carefully remove the egg with a slotted soon and let all the excess water drip off, you don’t want to make your toast soggy! 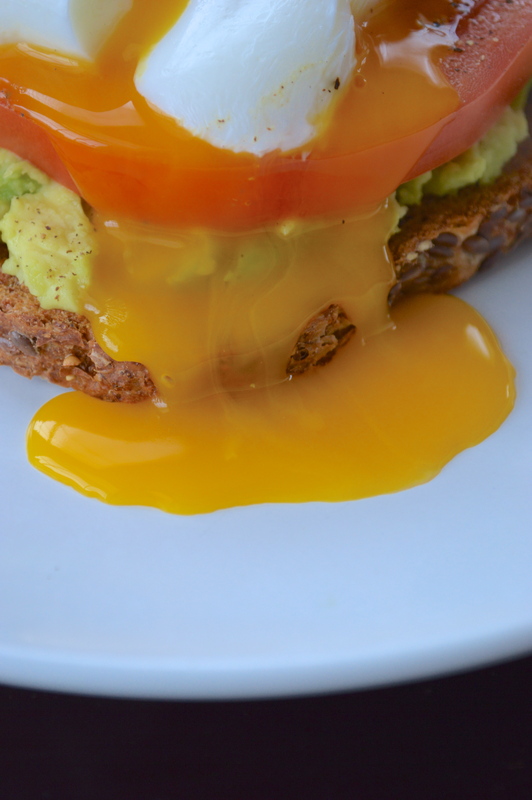 Carefully place the egg on top of your base and cut the yolk open when you’re ready to enjoy! In a small bowl, sprinkle the avocado with a little pepper + squeeze the lime juice onto the it then mash with a fork to combine. 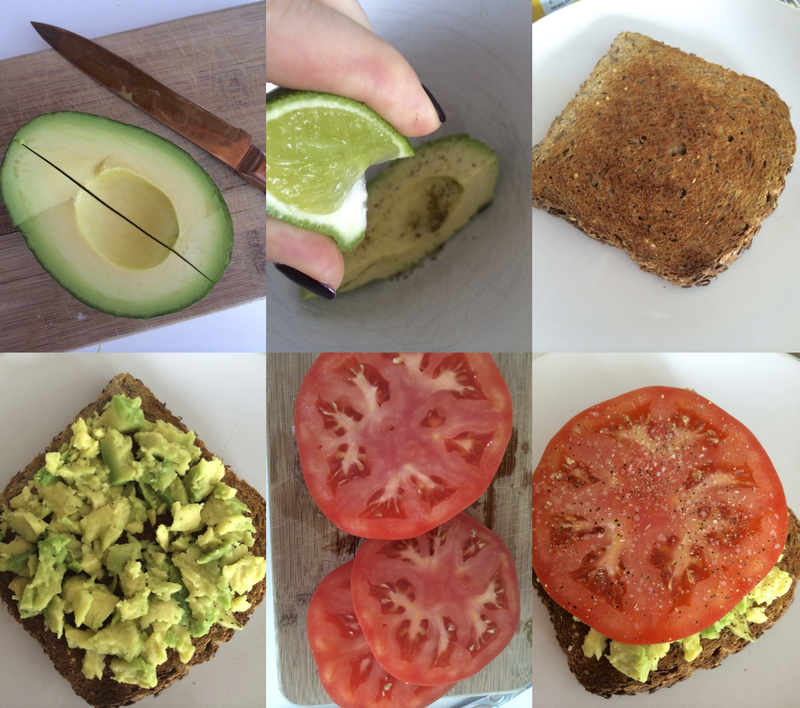 Toast the bread, put it down on your plate and top with the mashed avocado + tomato slice, seasoning it with salt + pepper. Now you can poach you egg. In a wide saucepan, fill with about 4 inches of water and the vinegar. Bring to a boil and then reduce to a steady simmer, sort of in between a simmer and a boil. Crack the egg into a shallow dish. Create a very slight “whirlpool” in the water before dropping the egg in using a slotted spoon gently in a counterclockwise motion to do this, then put the mouth of your dish right on the surface of the water and carefully slide the egg in. Use your spoon to wrangle in any loose bits of the egg whites and gently keep the water moving with the egg cooks for 3 minutes. After the three minutes, carefully remove the egg with a slotted soon and let all the excess water drip off. 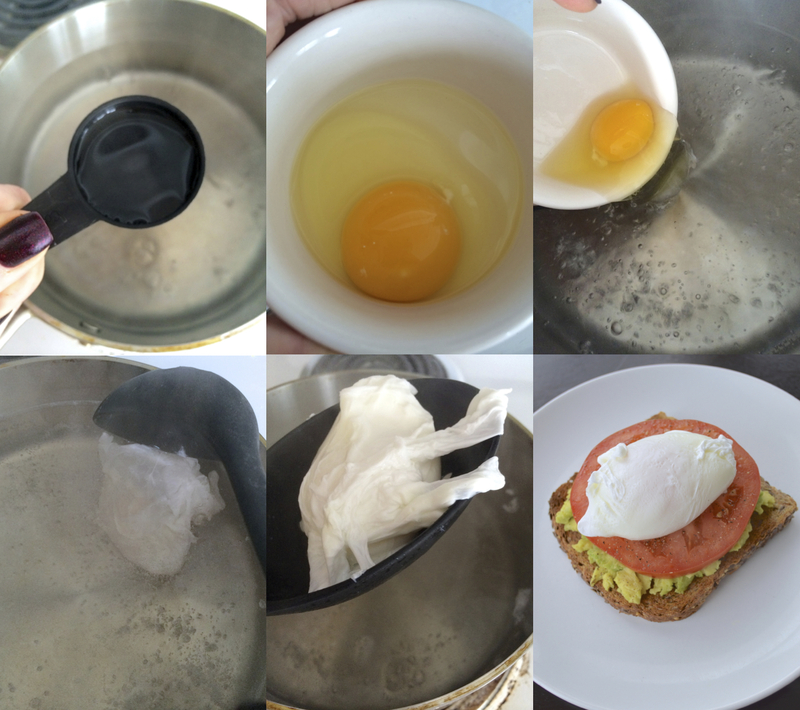 Carefully place the egg on top of your base and cut the yolk open when you’re ready to enjoy! This is a perfect breakfast! I tend to see more of these in Europe than in the US. Maybe you can change things here! I agree! It’s so simple but tastes SO great + I feel like more people here should love it! Thanks! Seriously, is there anything better than a runny egg yolk?? I wish I had seen this post before I had breakfast this morning! I will have to remember this combo for next weekend! Definitely keep it in mind, you’ll enjoy it!! Wow- that is a super energizing breakfast. Great idea. Yes it is! That’s why I love it… super yummy and power packed! literally one of my favourite breakfasts. Daily breakfast. It’s that or Chia seeded yoghurt…you tried? so easy to make as well. delicious. LOVE! My favourite combination 🙂 Love your page! Thanks Hannah! My fave combo too… nothing better!